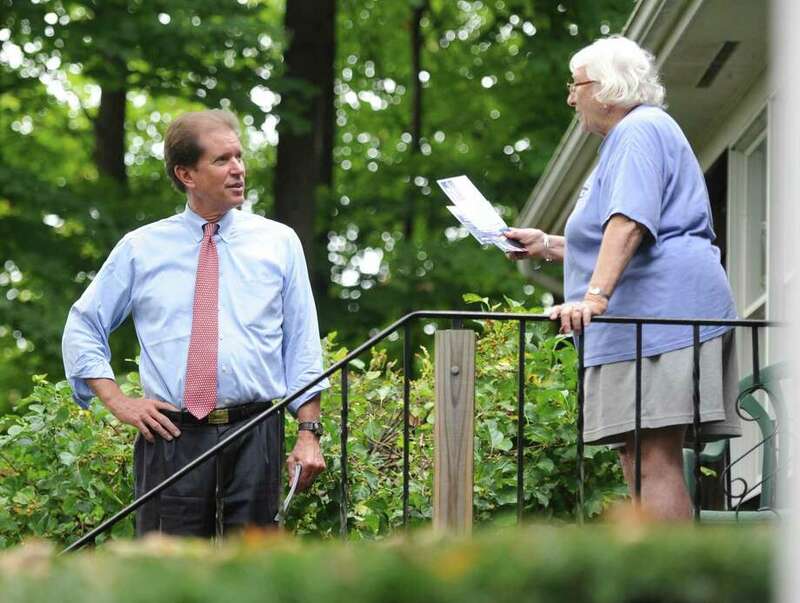 Veteran state Sen. L. Scott Frantz, R-Greenwich, shown here meeting a voter last fall, was upset by Democratic challenger, now-state Sen. Alex Bergstein, who spent about $321,000, including $285,000 of her own money. Alex Bergstein’s $321,000 investment in defeating veteran Republican L. Scott Frantz for the state Senate seat representing Greenwich and parts of Stamford and New Canaan was a lot of money for a $28,000-a-year job. For daily information on public policy issues, sign up for the CT Politics newsletter. But it was Essex First Selectman Norm Needleman, spending about $595,000, including more than half a million dollars in personal funds, who set the new state record price for a Senate victory, according to final campaign filings with the State Elections Enforcement Commission. Needleman, a Democrat who narrowly defeated veteran Republican House member Melissa Ziobron of East Haddam, wrote checks of more than $109,000 in the days just before and after the election. 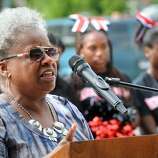 While Ziobron participated in the state’s public-financing program, limiting her fundraising and spending to about $114,000, she was supplemented by a political action committee supported by a group of national Republicans. The Washington-based Republican State Leadership Committee inserted about a million dollars in the 2018 House and Senate races in the state, particularly targeting Needleman; Sen. Steve Cassano, D-Manchester; Rep. Matt Lesser, who won the state Senate seat representing the Middletown area; and James Maroney, a Democrat who defeated state Rep. Pam Staneski in the campaign to fill the vacancy left by Sen. Gayle Slossberg, D-Milford. 23 (Bridgeport).................DENNIS BRADLEY, D........JOHN RODRIQUEZ, R.
Romano said that while Democrats such as former Gov. Dannel Malloy, supported corporations, small businesses in the state have been ignored. “The backbone of the middle class is small businesses, and we don’t have an economy that’s conducive to them,” he said. Frantz spent about $260,000 in the race. He loaned the campaign $172,500, including $105,000 in the week before the election. Fifty seven of the 71 Democratic and Republican candidates for Senate participated in the voluntary public-funding program, in which candidates first collect threshold amounts of individual contributions, and then are eligible for grants administered by the SEEC. Senate contestants in the Citizens’ Election Program are required to raise $15,300 in contributions of $100 or less. In approved, they may be eligible for 39,410 to wage a primary, plus as much as $95,710 for a General Election. House candidates can received up to $28,810 for a general election, with a smaller threshold. Frantz, a 10-year Senate veteran, who’s returning full-time to private equity management, said his 635-vote loss was “fair and square,” with Stamford Democrats the difference for Bergstein. Frantz said that Connecticut’s anti-Trump feeling was hard for the GOP to overcome. “Bob Stefanowski (the candidate for governor) tried his absolute hardest, and for a newcomer did extraordinarily well. Frantz said he’s known Gov. Ned Lamont for years and knows he’s in a tough position with a projected $1.7-billion deficit in the budget year that starts July 1, plus an estimated $100-billion under-funded pension liability. “Ned’s a terrific person and I wish him nothing but the best of luck trying to work through this fiscal morass to a much more stable fiscal situation down the road,” Frantz said. An earlier version of this story did not include the amount L. Scott Frantz spent on his campaign.